Listed below are some prominent IDP news and notes coming out of Week 4 NFL preseason action. Brian Urlacher said he will play in Week 1, but he also stated that he doesn't think his knee will "ever be the same." With this said, he's a player I'll be avoiding in my drafts. 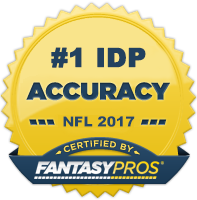 He tends to get overdrafted in most leagues anyway due to his big name and he will have a hard time outperforming his typical ADP. On initial inspection it seemed as though ILB Derrick Johnson's injury could be significant. However, Romeo Crennel recently mentioned that it was just a twisted ankle. The Chiefs are confident that he will be available for their Week 1 game against Atlanta. After missing the entire preseason with a hamstring injury, Michael Boley returned to practice on Saturday and is expected to be active for Wednesday night's season opener against the Dallas Cowboys. He was a solid LB3 option last year, but owners may want to tread lightly with him early on until he shows he's back up to full speed. In a bit of a surprise move, the Giants placed CB Terrell Thomas on IR. He's safe to drop in essentially all fantasy formats. Packers linebacker Desmond Bishop was placed on IR. This move was all but a formality as he was expected to miss the majority of the season after undergoing hamstring surgery. His replacement D.J. Smith has played well and is a nice high floor, LB2 for fantasy owners. Akeem Jordan has unseated Brian Rolle as the starting WLB in Philly. I don't see a ton of value here as Jordan will be a two down linebacker and DeMeco Ryans and Mychal Kendricks will be gobbling up a majority of the tackles. A federal appeals court rejected D.J. Williams' appeal of his six-game PED suspension. He's also facing an additional suspension for driving while ability impaired. This is turning into a situation to avoid completely in drafts. There are a lot of good fantasy LBs on the board this year and there isn't much need to take a guy who could be suspended for half the season and possibly even released. Move Wes Woodyard and Joe Mays up your boards. According to Rotoworld, Bucs MLB Mason Foster (hamstring) has resumed practicing and looks to be on track to play in the season opener. Broncos second-round pick Derek Wolfe has won the starting left end job over Robert Ayers and should see substantial playing time between defensive end and defensive tackle. He's worth a look in deeper redraft leagues as a DL4-/DT2-. Lesser version of J.J. Watt. Jets NT Sione Pouha (lower back) is in danger of missing Week 1 against the Bills. Giants DC Perry Fewell confirmed Sunday that Michael Coe will start at cornerback in Week 1 opposite Corey Webster. Coe could be a sneaky one week play against the pass heavy attack of Tony Romo and the Cowboys. He will be picked on early and often and could rack up a good amount of solo tackles as a result. In a surprising development, Luke Kuechly seems to have fallen out of favor for the time being in some subpackage sets. The Panthers have been using Thomas Davis on a lot of third downs. My gut is telling me that this won't stick very long. It's possible that Davis rotates in for Jon Beason AND/OR Kuechly throughout the season. Like what you've read? Looking to dominate your 2012 Fantasy Football draft(s)? For $5 you can get complete access to The IDP Guru's comprehensive and exhaustive 2012 Fantasy Football Draft Guide.